Karate-do is a martial art that originated in Okinawa, modified and transformed into a philosophy of life by Master Funakoshi. Before these modifications it was only a group of techniques that allowed self-defense, without having to resort to weapons external to the human body. Even though there was an ample influence from Chinese martial arts, the development was mostly, and mainly, Okinawan and therefore Japanese. Master Funakoshi, influenced by traditional Martial Arts from mainland Japan such as Kendo, Judo and Kyudo, modified Karate, which could only be called Karate-jutsu as it was based solely on technique, an art of battle, and emphasized the art from the philosophical point of view, where one could take what had been learned and extrapolate it to the life of each practitioner. 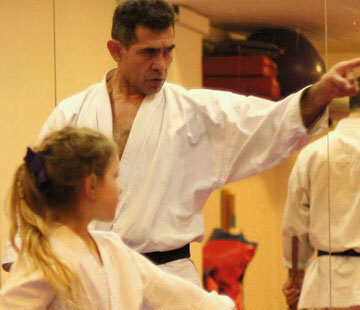 Because of this Karate is a way of life: Karate-do (do, meaning way or path). 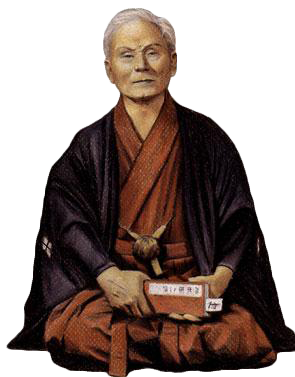 Gichin Funakoshi, then, combined the Karate techniques with traditional Budo (the martial path), thus adding the essence of Budo within Karate, a real path of martial arts. Located south of Japan, and previously known as the kingdom of Ryukyu, the island of Okinawa was the place of origin of Karate. Until the beginning of the XV century, Ryukyu was divided in three independent kingdoms: Chuzan, Nanzan and Hokuzan, each one fighting the other over supremacy. Chuzan eventually prevailed and the country was unified under its king, Sho Hashi (1372-1439). A non-militant government was immediately established. A strict edict prohibiting any possession of weapons was enforced. They enjoyed two centuries of peace, then in 1609 they were attacked by Shimazu, military governors of south Kyushu, Japan. After a big resistance, Ryukyu falls in the hands of Shimazu. Weapons were prohibited once more, this time not only to the commoners, but to the high classes as well. Many historians agree that this second prohibition was the stimulus for the creation of means of self-defense without weapons. Even so, some forms of combat without weapons was already in practice before the invasion. Since Ryukyu was a tributary state of China, there were frequent periods of contact with China, making it natural for kenpo (lit., "fist method") to be imported to the island. Elements of kenpo were probably adapted and incorporated to the local combat styles. This is how the two precursors of Karate were originated: okinawa-te y to-de. With the prohibition of weapons, the practice of methods of combat without them was rapidly covered in secrecy, since, understandably, the locals did not want the existence of these methods to be known. The practice of not revealing the principles of their art to foreigners was not a characteristic exclusive to Karate, this also happened in Kendo and other martial arts. But there was no comparison to the great precautions that were taken in Ryukyu, where there also existed a prohibition of keeping written records. During the Meiji period (1868-1912), even when there was no more need for discretion, the century-old tradition of secrecy was maintained. During its beginning, Karate was simply called "te" (Hand). When its practice was incorporated as part of the physical education programs in Okinawan schools at the end of the 19th century, and due to its growing popularity within Japan, it was renamed "Karate" (Empty Hand), to distinguish it from "to-de", a form of Hand originated in China. The two original styles of Karate, developed in the regions of Shuri and Naha, were respectively named "shuri-te" (Hand of Shuri) and "naha-te" (Hand of Naha). Today there exist numerous different styles of Karate, both in Okinawa and in Japan, but most come from the previously mentioned ones. In 1891 or 1892, according to Master Funakoshi, a school teacher started teaching Karate to his students. 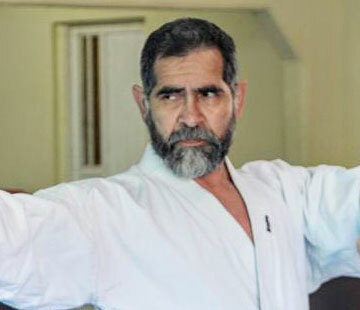 When the time to came for the army draft, it was immediately noticed that those who were training Karate were in better physical shape than the others. Later, Master Itosu was invited to attend to a meeting of school principals and to make a demonstration with his students. They were very impressed and soon Karate was incorporated to the physical education program of two of the major high schools in Okinawa. In May 1922, the Japan Ministry of Education held the First Track and Field Exhibition. Master Funakoshi, the president of the Okinawan Martial Arts Association, was invited to participate and exhibit the local martial arts to Japan (mainland). The master prepared the material and left to Japan. After the exhibition, he was forced to stay due to all the interest shown initially by Jigoro Kano, the great Judo master, for whom he made several demonstrations with nearly one hundred judokas. Funakoshi was an admirer of Kano and his martial art, which is why he considered it a great honor to be able to enter the temple of Judo, the Kodokan. He earned the admiration of notable judokas and an eternal and respectful friendship with Jigoro Kano. In the technical plane, Funakoshi was inspired by the teaching method of Kano for his modernization of Okinawa-te, introducing the belt degree system (until then, these were only used to hold pants). This was the beginning of a great amount of activities in Tokyo, which prevented him from coming back to Okinawa for a long time. 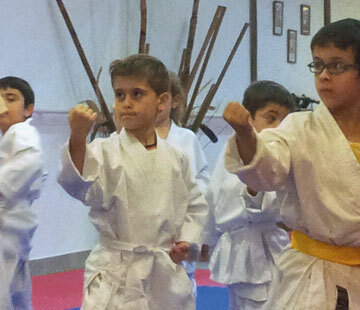 That is how the beginning of Karate-do was established, created through the fusion of Okinawan martial arts and the Budo philosophy of Japanese martial arts, such as Kyudo (the art of archery) or Kendo. In general, the Karate-jutsu that originated in Okinawa and was only a method of self-defense, by extending throughout Japan and imbue with Zen philosophy, also became a method of personal development, changing the justu (technique) for do (path, way). In 1949 the Japan Karate Association is formed, which celebrated in 1957 the first tournaments in Japan. This sports practice extended to the West during the 1950s decade. An important person in the development of Karate, and also a former school teacher and founder of Shotokan-ryu, Gichin Funakoshi was born in Shuri in 1868. In 1879 he started learning under masters Itosu and Azato. During the Taisho period, under the rule of emperor Taisho Tenno (1912-1921), Funakoshi introduces Okinawa-te to high ranks of the imperial marine. In 1916 he participates in the first public demonstration at the Budoku-ten in Kyoto, Japan, the oficial center of all martial arts at that time. The official history of Shotokan begins on April 1st, 1922 when master Gichin Funakoshi starts his first lesson at the "Normal High School for Men" in Tokyo. Funakoshi established his first classes at the "Tabata Poplar Club", which actually was a social club where all the new educated intellectuals gathered. Despite the interest, this social class did not have the physical capacity or enough discipline to train seriously. Funakoshi was forced to move his classes to a student dorm room in the Suidobata area, Tokyo. This is where his real first Karate club was established. Hoan Kosugi, an artist that had previously helped the master at the Tabata Poplar Club, convinced Funakoshi to edit a book, of which he would design the cover. In it he placed the master Funakoshi's Tiger and entitled it "Ryu Kyu Kempo: Tode", editing it at Bukyo-Sho in November 1922. By the end of 1924, master Funakoshi was asked to instruct a small group of students of Keio University. The Sensei accepted the invitation, with the full support of the leaders of the university. This was the first university Karate club in Tokyo and it exists until this day. Afterwards, the idea of university Karate clubs was developed, existing today over 300 clubs linked to the different schools in Japan. 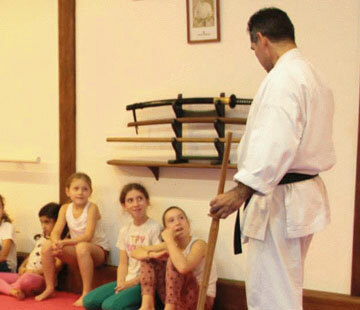 These clubs generated the backbone of Japanese Karate and had a huge importance in the expansion of this martial art. From this university reserve, Funakoshi formed a prestigious vanguard of students among which names such as Obata, Mikami, Matsumoto, Otake and Ohtsuka stood out. In 1927, discrepancies regarding the teaching system began to appear, particularly about ju-kumite (free combat). 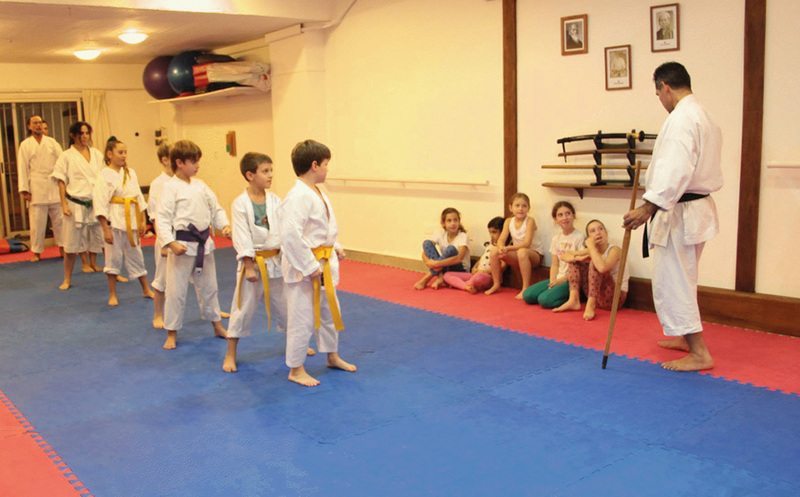 It was necessary to introduce numerous innovations to ensure the success and rapid diffusion of Karate. Due to this, Yoshitaka Funakoshi (Sensei Gichin Funakoshi's son) gathered a group of students to train with and completely dedicate themselves to the development of Karate. Under the leadership of Yoshitaka, great changes were bread between the years of 1930 and 1935, mainly in Kumite. First, Gohon Kumite (five-step combat) was developed, in which the attacker performs five consecutive forward attacks and the defender blocks them while moving backwards, ending with a counterattack in the final defense. In 1933 Kihon Ippon Kumite (one-technique combat) is structured; Ju Ippon Kumite the following year, finishing with Ju Kumite, established in 1935. At that moment it was decided to establish a Central Dojo (Hombu Dojo). A committee was formed (Shoto-kai) to establish a fund to build it. In January 29th, 1936 Gichin Funakoshi personally inaugurates the Dojo in Tokyo, which he named Shoto-kan. Kan means place, Shoto was the pseudonym Funakoshi used to sign his poems (shoto literally means: "pine-waves under the wind"). That same year, Gichin Funakoshi published a new book, where he included the development Yoshitaka had contributed. The book was called "Karate-do Kyohan". It was then clear that this was an entirely new Japanese Karate system. Gichin Funakoshi used a new ideogram to write "kara". The old ideogram could be read as 'Tang', in direct reference to the Chinese dynasty of the same name. Since the day of the publication, the old denomination: "Technique of Chinese hands", was modified to: "The Path of the Empty Hands", as is known today. In 1941 Japan enters the War, and many of the older students went into military service to never come back again. During a bombing in Tokyo, the Shoto-kan Dojo was destroyed. When the war was over in 1945, Yoshitaka days due to tuberculosis. 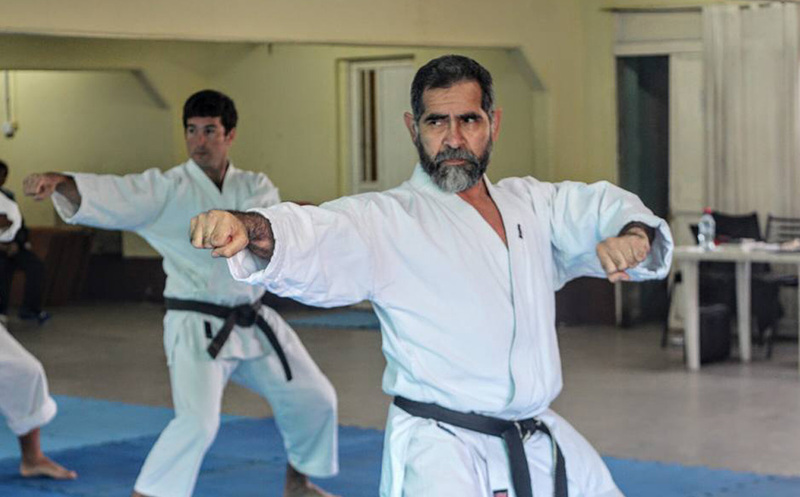 U.S. Armed Forces General McArthur prohibited the training of Karate-do and all the other Japanese martial arts, and even though some training was done in secrecy, the development of Karate-do stopped. Little by little the students of Gichin Funakoshi came back to Tokyo. Discussions about how to free Karate-do from the prohibition and how to rebuild the Dojo began. The man who achieved this was Masatoshi Nakayama, who had come to know the Chinese culture very well and thanks to this he was able to convince the Minister of Education to inform that Karate-do actually was a Chinese boxing sport and should hardly be included among the other Japanese martial arts. The bureaucrats were convinced and lifted the prohibition on Karate-do. This is how it became the only martial art allowed to be practiced after the war. Isao Obata unified the university clubs and private Dojos into one single organization, which received the name Japan Karate Association (JKA), in 1949. Gichin Funakoshi was named First Chief Instructor, Isao Obata was named Director and Kichinosuke Saigo was named President of the organization. In 1951, the U.S. Armed Forces established a martial arts training program. They sent their physical training instructors to the Kodokan in Tokyo to be instructed in Judo, Karate, Aikido and other arts. Karate was taught under the leadership of JKA, counting with Nakayama, Obata and Kamata as masters. The problem with this is that people who had had a bit of limited training in Karate-do came back to the United States and started teaching their own style. By the middle of the 1950s there already were over 200 versions that called themselves Karate styles, many of them directed by people with few training. 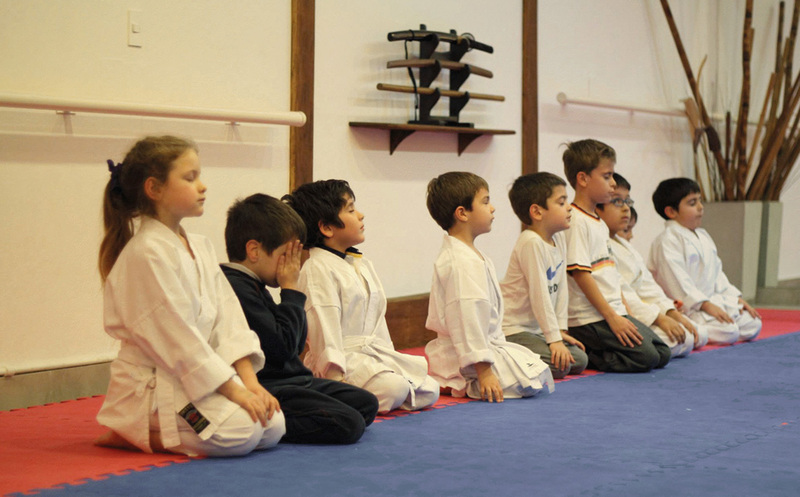 Therefore, Masatoshi Nakayama, under the guidance of Funakoshi, created the Instructor Training Program to ensure the quality teaching of real Karate-do. 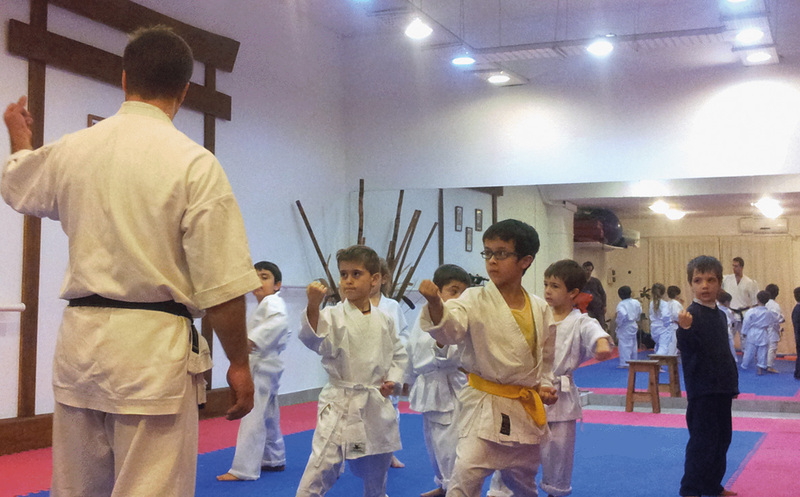 Because of this program, instructors were sent throughout the world to extend JKA Karate, known as "Shotokan". In the year 1970, during a reorganization of the organization that governed traditional Karate, the JKA Karate group in the U.S.A. separated and created the JKA-US, part of the AAKF (All American Karate Federation). Hidetaka Nishiyama (disciple of Gichin Funakoshi) was president of both JKA-US and AAKF. In April of the same year the AAKF became a member of the U.S. Olympic Committee. In the year of 1973 Nishiyama was co-founder of PAKU (Pan American Karate Union) and is chosen as its first executive director. An international meeting followed later in New York City resulting in the formation of the International Amateur Karate Federation (IAKF), with Nishiyama chosen as its executive. 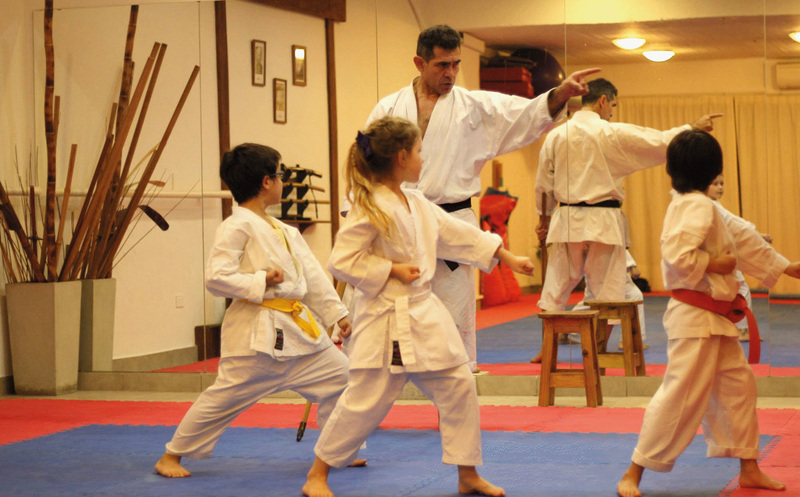 In 1985, the IAKF changed its name to International Traditional Karate Federation (ITKF) because the word "Karate" had become a generic term applied to a variety of kicking/punching sports. Thus, the ITKF, under the direction of Nishiyama, sought to mark the difference as the governing body of traditional Karate.